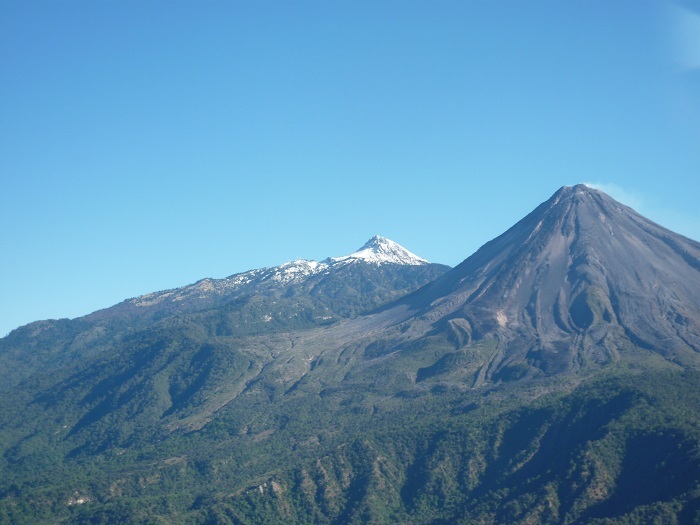 A team of geologists from the Museum and Imperial College are in Mexico carrying out fieldwork at two of the most active volcanoes in the world: Popocatépetl (Popo) and Colima. Catch up with their adventures in this series of blogposts. Harder than spotting lava at Popocatépetl's flanks: Whoever finds Colima volcano in this photograph is a true eagle-eyes and deserves an honorary display in the Museum's bird galleries. Fuego de Colima, and its snowcapped older sister, Nevado de Colima, form an impressive mountain mass towering above the State of Colima. 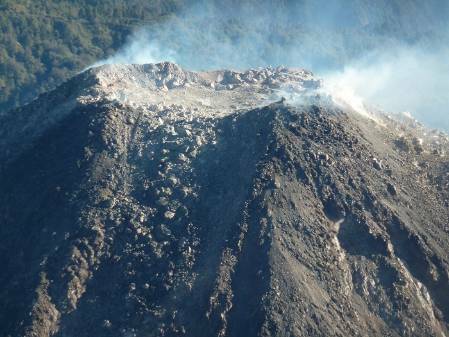 Fuego de Colima has been very active in the past few months. 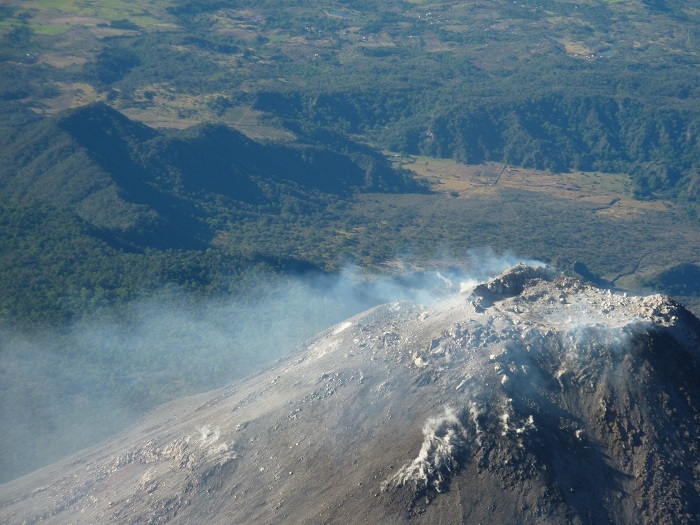 It seems that Fuego de Colima is preparing for something bigger in the foreseeable future, and authorities are on alert in order to protect the ~300,000 people living in the vicinity of the volcano. 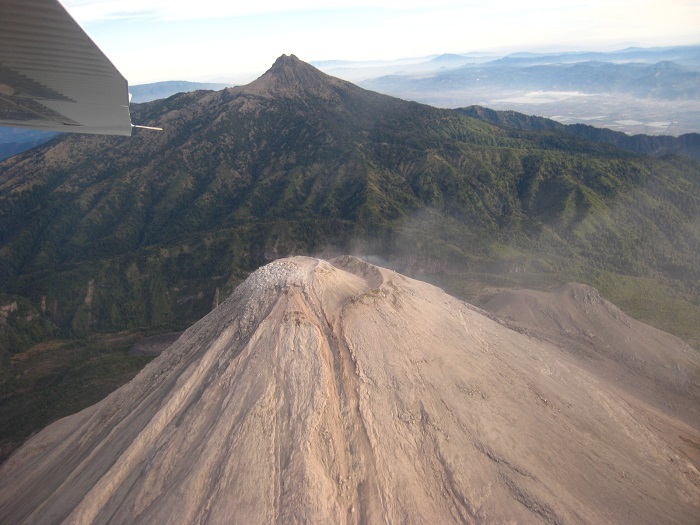 Colima volcano, airplane view: gases are constantly emitted from the crater region. The surface of this area is several hundred degrees celsius. Even though there is some zoom involved in the picture, we are disquietingly close to the place where the explosions happen. 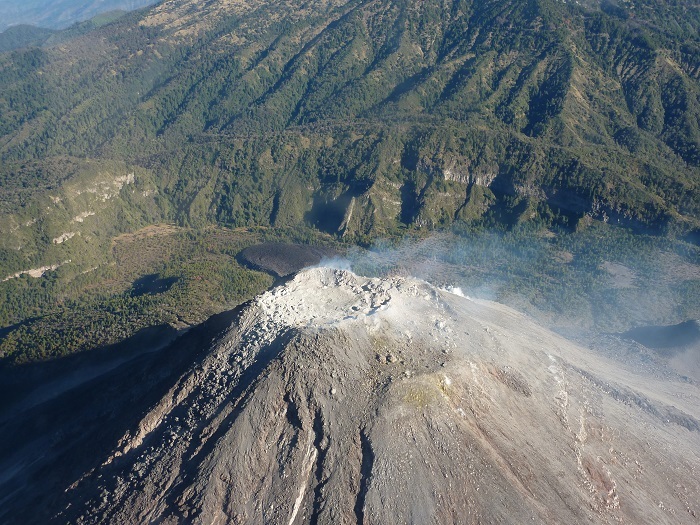 The channel in the foreground of the picture is in fact a lava flow descending Colima's SW flank. …In December 2013, the summit looked very different. Here, we can see a fully intact, hemispherical dome. The explosions that have taken place since then have literally blasted off the cap of the dome. 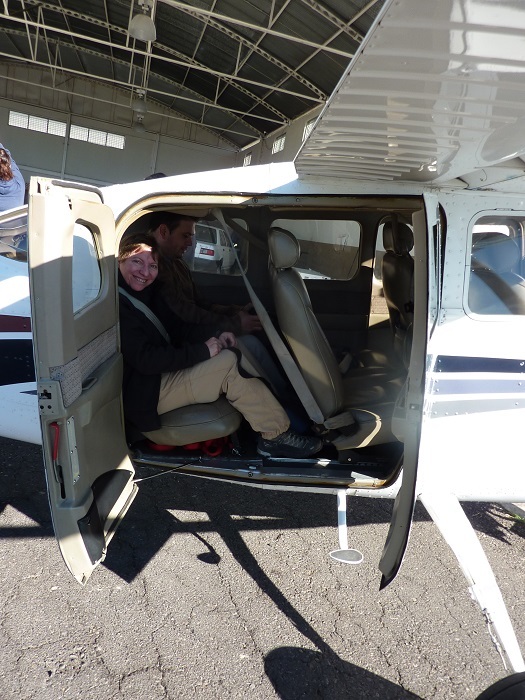 After the flight: Chiara is happy about what she has seen, as well as about being safely back on solid ground. 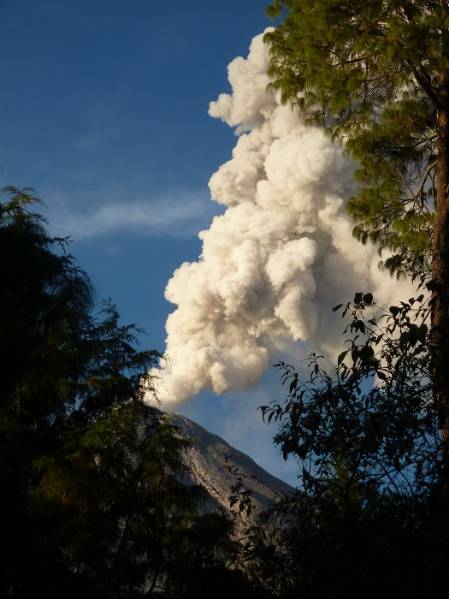 As soon as we are back at the airport, the volcano starts an impressive performance of steam and ash emissions. We congratulate ourselves that we are not in an airplane above the top right now and take more pictures! This eruption column is about 4 km high and contains very little ash, as can be gathered from the bright colour. However, if you look closely, you can see some ash falling out of the cloud towards the ground. Night falls, and Fuego de Colima continues its show. We could show you plenty more pictures of Colima erupting, since it continued similarly throughout the rest of our stay (and is still ongoing!) and we were quite trigger-happy. But this blog entry is already quite long, so if you want to see more of Colima volcano, we would like to refer you to the freely accessible webcam that delivers live, high-quality pictures right to your computer screen. 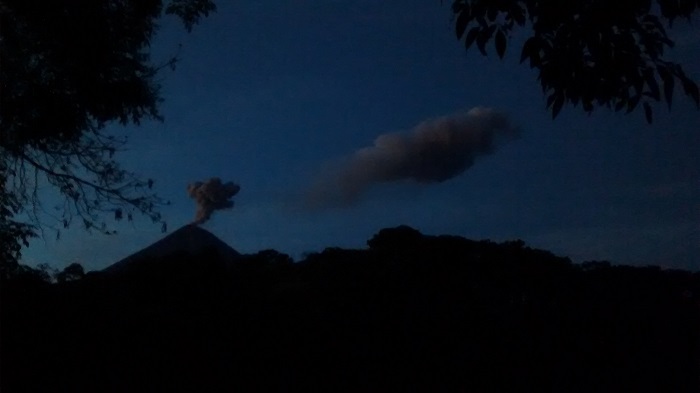 As I said, there are several eruptions like the ones shown above every day, so if you spend some time with it, chances are that you will be live witness of a proper volcanic eruption! 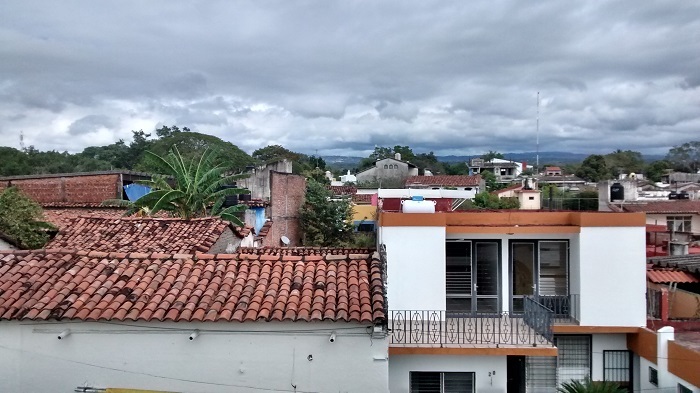 Sadly, our time at Colima is already over now, and also our field campaign draws to a close. 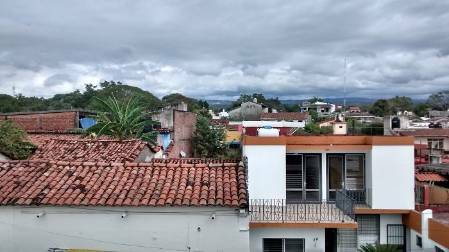 Stop by here shortly for final, picturesque remarks about our work in Mexico. Lyme Regis Fossil Festival - are we there yet?